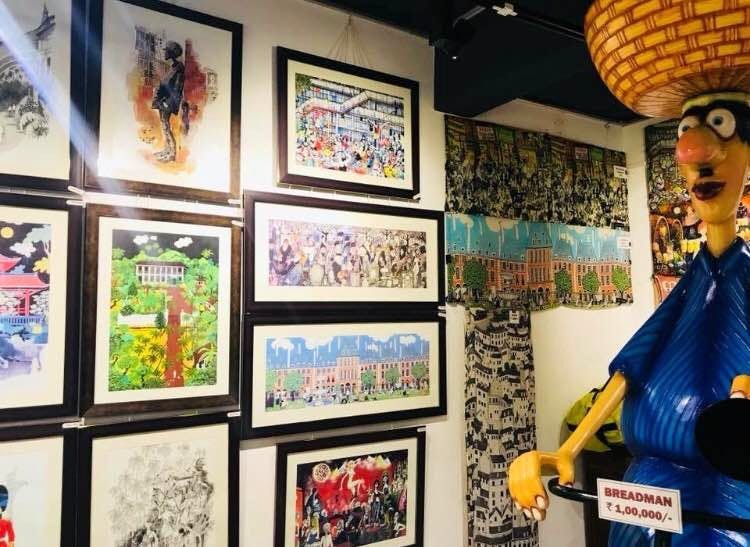 Inspired by the famous cartoonist Mario Miranda, this gallery is a veritable art hub of his gigantic body of work. You enter and you are bombarded with images, caricatures, and illustrations of his work staring at you from every conceivable space. There are walls full of pictures of his cartoons in different sizes, lanterns hanging from the ceiling, murals, shelves laden with mugs, plates, bowls, figurines, keychains, tiles, kettles, table lamps, paperweights, coasters, books, bags, scarves, beach robes, t-shirts cushions, fridge magnets, badges, postcards, prints, and the list goes on. Mario's work revolved around his beloved Goa and the quintessentially Goanese way of life ‘Susegad’ - the quiet and laid-back attitude of life which is deeply ingrained in their culture. To see the sardonic humour in the everyday life of Goa and it’s people and depict it with a tongue in cheek 'cheekiness' was what he was known for. You have larger than life figures from his work scampering around inside and out. It will take you hours to browse through the huge variety that is displayed here. And of course, you will come out with quite a big dent in your pocket. The sheer volume of merchandise will be too irresistible to not give into. The price range is INR 150 onwards and you will find a little something for everyone back home.